* * The draw has closed today: watch for the giveaway results. * * Today it’s official. My long-awaited mandala oracle deck has now been launched and is available to buy. It’s called ‘A Sea of Calm’. And it’s such an exciting moment. 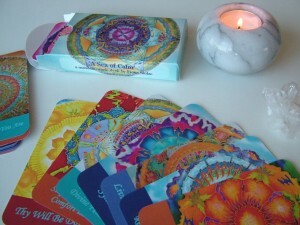 The good news is that I am now doing a giveaway and giving one of you the chance to win a free mandala oracle deck. And this is what I’d like you to do to take part. Just add your name in the comments box below giving me an email address I can reach you by. And if you like, you can come and follow me on my Facebook Silkandart page or sign up for my Silkandart newsletter. Or if you have an ideas for sharing this idea around more, that would be lovely too. I’ll leave that up to you. What I’ll do is leave this open until Sunday evening, May 26th and the put all the names of those who’ve commented on this post in a hat and draw out a lucky winner. I will then contact you by email to get your full postal address so that I can send the deck to you. Okay, that’s it. I hope you’re the lucky one I can send a deck to. Looking forward to including you in the draw. This entry was posted in CARD READINGS, MANDALA ART and tagged fionastolze, intuitive readings, mandala art, mandala deck, mandala oracle deck, oracle cards, oracle deck giveaway, oracle readings, silkandart, spiritual guidance, spiritual journey. Bookmark the permalink. I’m so very happy for you, Fiona! I’m also incredibly grateful for you and your friendship and it’s been a pure joy to watch you grow and create; manifesting beautiful things from Spirit. Many, many blessings to you and much love, of course. 🙂 Namaste! What a gorgeous deck! Congrats! Fiona……Congratulations!!! Gentle, sweet creativity from the heart. Beautiful name for beautiful cards…..How much are they? Fiona! So exciting for you! Beautiful pieces of artwork. Your readings are always spot on – it amazes me! Looks like it may be time for you to do some psychic fairs around town and bring your cards to sell 🙂 Or show them at local spiritual stores and see if they are interested in buying some decks or selling them on consignment. these are beautiful! i am thrilled for your accomplishment and hope to work with these in the future when it feels time! Your mandalas are not only lovely, they also have a beautiful energy to them. Anyone who wins your deck will be very lucky, but buyers are also lucky to have such a masterpiece in their personal collection. I wish you great success with your deck! I am very excited about getting this pack, can’t wait to feel vibe imprinted by your mandalas, the silk touch of the cards, to shuffle them and find out what tomorrow brings. I do also have a good friend that does readings with some very old and rugged cards, and who would LOVE to have a pack of theese from you. So if it is to win, the deck will surely go to her. congrats this must be such a proud and exciting moment!!! I’m so inspired by the vibrant beauty of your artwork Fiona, and marvel at your prolific creativity that’s finding expression in so many art forms including these lovely cards. 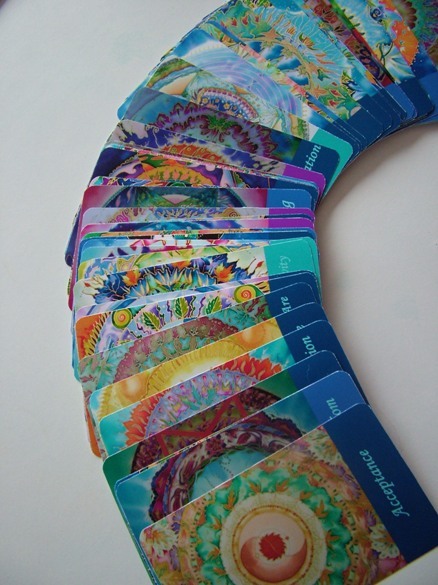 The vibrancy of the cards speaks to me each time I’ve seen them. Congratulations on birthing these! May they travel far and wide. I’d love to own a deck and hopefully will win one! Congratulations Fiona!! What a lovely deck!! Absolutely love it! I can’t wait for my deck to arrive. This is exciting. If I win this one, it is going to a Wellness Group that meets regularly- it would be perfect for the group. My daughter has purchased this deck and I’d love to have one of my own. Your mandalas are so beautiful … love your work. What a lovely story! The decks must be very special as you are! I really appreciate how you share yourself so openly. I love your artwork and also your posts. Thank you for bringing light to life! They are beautiful Fiona! Lovely rich colors. Congratulations! Wow, just beautiful. Thank you so much. I will think positive so I will win. It’s been so exciting watching the deck birthing, congratulations! Your lovely paintings attracted me a few months ago. My eyes are widely opened and then now is attended to the heart. Thank you for bringing me back to the colorful world. Best regards. Dear Fiona, I would love to win another deck and share them with a friend. I can’t wait to receive the deck I red red. You ave created such a lively masterpiece. This deck is gloriously beautiful! Forgive me for asking, but is this silk-screen? Also, is this deck for meditation? I will follow your site – Bonnielynn Brankey posted your deck – so I had to check it out. I have lots more questions, but will learn more from your site. I realize the “drawing” is over, but I still wanted to let you know how much I love these! The best always in all your endeavours! Hi Brinda – lovely to hear from you. This deck is a reproduction of my original silk paintings. It’s not silk screen printing as that would have been much more expensive and wouldn’t have been able to reproduce such a wide palette of colours as I was told. These images are perfect for meditation too as they contain both a mandala image as well as a theme with futher suggestions on what to reflect on for each card (in the downloadable booklet that goes with it).